The Naruto manga is ending. 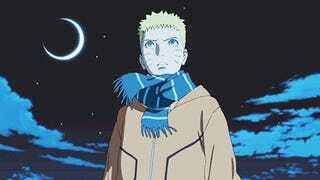 The upcoming feature film is called The Last: Naruto the Movie. And supposed leaked images might give away some of the film's biggest surprises. Or might be totally fake. Warning: This article contains possible spoilers, which might be complete bunk. However, if you do not want any part of The Last: Naruto the Movie possibly spoiled, do not continue. Everyone else, read on. Recently, a slew of possible art for the upcoming movie has leaked online. The images, it seems, were first posted on bulletin board 4chan, which is why some Japanese net users online in Japan are suspect of the art, believing that, instead, this is fancy fan art. Yep, so Naruto and Hinata apparently made other people. It seems. Or have miniature people. Anyway, there are cute, small characters. According to Japanese site My Game News Flash, the boy's name is "Bolt" ("Boruto," which is a pun on "Naruto," which can mean "maelstrom" in Japanese) and "Himawari," which means "sunflower" in Japanese ("Hinata" can mean "sunny place" in Japanese). A good chunk of the art shows outfits that can be seen in the most recent trailer (here is an English subtitled version), but some of the attention to detail is rather, well, obsessive. The art in the "leaked" images is quite good (and even if this is only fan art, this is excellent fan art), and in this unconfirmed concept art, there is some of the same labelling we've seen in other official art. You can see, for example, an arrow pointing to the leg and the Japanese word "hada" (ハダ) or "skin." Then, some katana (刀) are labelled as such, and we can see an "under clothes" (naka no fuku or 中の服) as well. As far as I can tell, none of the Japanese seemed odd or strange, which is typically a dead giveaway for a fake. There are similar labels on the official art, but the labelling is far more obsessive than on these leaked images. Maybe there is just less to label? As mentioned above, it appears to have originated on 4chan, but spread through Tumblr. This image is taken directly from popular Japanese anime blog Yaraon! "Since these come from 4chan, it's best not to believe them," wrote one Japanese commenter (via Yaraon!). So, it's possible that some of the is real, but other parts, like the children Bolt and Himawari, are not. It's also possible that all of this is real as well as none of it is. We'll know soon enough when the movie opens in Japan this December.